What if I am not Lutheran or Christian? You are welcome here! Faith matters deeply at Luther College. It matters enough to engage people of many faiths and religious traditions, as well as people without religious affiliation. 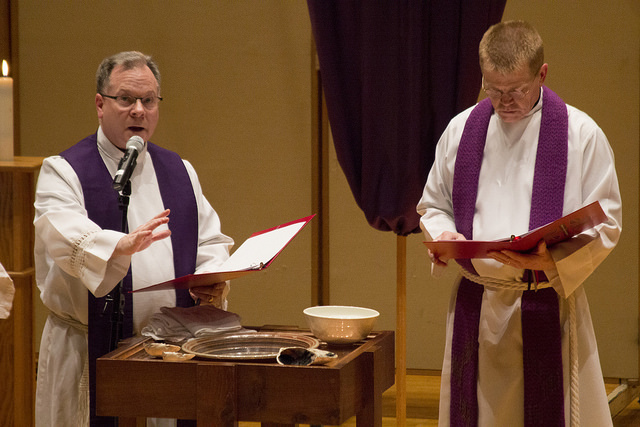 The college's denominational identity is Lutheran, but many voices and experiences fit here. We encourage participation in this faith and learning community because we feel we have much to offer the world. A wide range of groups offer opportunities for service and learning in cooperation with College Ministries, including the Catholic Student Community (led in partnership with students by Father Don Hertges), Fellowship of Christian Athletes, and the Muslim Student Association and Allies. We have a great relationship with a variety of churches and faith communities in Decorah, including the Rymonji Buddhist Monastery in the outskirts of town, with whom we partner to offer bi-weekly Buddhist meditation sessions on campus. What worship opportunities are there and what are they like? Worship is at the core of Luther's life as a community of faith and learning. Daily, there are opportunities on campus to participate in and lead worship services that will strengthen and nurture your faith, and also help you grow as you encounter a diverse and vibrant community of faith. In any given week, students, faculty and staff participate and lead in services that draw from global, contemporary, and traditional music. Service music is offered by everything from 100 member a capella choirs and organ to a rock band or global music ensemble. The college pastors share in preaching and reflection together with hundreds of students, faculty, staff and visitors who share willingly of their faith and experience. Our eight weekly worship services include daily chapel (a twenty-minute time for prayer, song, and preaching) during weekdays, two weekly celebrations of Holy Communion, and a Sunday night contemporary service of drama, preaching, and music. Students provide significant leadership in all of our services. College pastors Mike Blair and Anne Edison-Albright are available to all within the Luther community for conversation, reflection, vocational discernment, and counseling. They offer Bible studies with the assistance of student leaders, mentor student groups, and are active in the Decorah and broader faith community. Right in the middle of our campus is the Center for Faith and Life (CFL) where architecture embodies the college's mission to intersect faith with learning, freedom with responsibility, and life's work with service. The CFL Main Hall is intentionally the place where concerts like Dave Matthews' Live at Luther College and lectures by Nobel Laureates are held while also providing space for the worship life of the community. This intersection of faith and life encourages creative interaction and cooperation by the college's many departments with the faith life of the community. Other worship services and events may also take place in a small recital hall in the CFL, and we also have a small prayer chapel that is open as a meditation and prayer space 24 hours a day. In Luther College Ministries, we affirm with the apostle Paul that in Christ "there is neither Jew nor Greek, there is neither slave nor free, there is neither male nor female" (Galatians 3:28). Christ has made us one. We acknowledge that this reconciliation extends to people of all sexual orientations and gender identities. The Luther College Congregation is a member of the Reconciling in Christ (RIC) Program. For more information, take a look at the ReconcilingWorks website. Since this is a Christian college, will I be required to attend worship? Luther has a vibrant student congregation that integrates religious life on campus for the hundreds of students who choose to participate in worship, Bible study, discussion groups, and service opportunities. While we are committed to providing students opportunities to grow and explore their faith, we deeply believe that students must discern their own engagement in their faith tradition, and therefore do not require participation in worship. Service is important to my faith. Will I have service opportunities at Luther? At Luther, we believe that one's entire life relationships, activities, and professions pursued should be seen in terms of vocation, or calling. Put simply, vocation represents the many ways you live your life as you serve God and neighbor. Service opportunities and mission trips are core to the formational experience at Luther, where students serve neighbors in the immediate Decorah community, willingly respond to local and regional disasters, and travel to the Gulf Coast and abroad to serve and learn in partnership with others. Our service opportunities are all accompanied by intentional reflection that helps us not only process what we see and experience, but ask deep questions about the inequalities and social concerns often revealed by experiences of service. Hear one student's perspective on how faith plays out at Luther. Izzy Michaud '19 writes about her experience attending Luther's ecumenical Ash Wednesday service on her student blog. College Ministries maintained by Tricia Crary. Page last updated on 28 August 2018.